Do you need access to an Outlook blocked attachment? AttachmentSecurity is a Microsoft Outlook addin that gives you access to almost any Outlook blocked attachment. In fact, AttachmentSecurity gives you instant access to almost any attachment in Microsoft Outlook with the simple click of a button by programmatically modifying the list of blocked Outlook attachments in the Windows Registry. Once installed, AttachmentSecurity becomes a part of Microsoft Outlook. AttachmentSecurity's interface is launched from Microsoft Outlook's toolbar, and allows you to easily and quickly block or unblock "Level 1" (files defined by Microsoft as potential security risks) attachment file types. AttachmentSecurity is free, but we ask that you register the product (there is no charge for registration) so that we may inform you of updates to this product and other products released by Lookout Software when they become available. Always keep in mind that Microsoft has designed Outlook, by default, to block these attachments for a reason: to stop the potential spread of computer viruses. Before you unblock and/or open any email attachment in Microsoft Outlook be certain that you know that the file is from a trusted source who takes necessary precautions with security on their own computer. Also, be sure that you've applied the latest updates to your anti-virus software, and that it's configured to scan all files before opening them on your computer. Finally, AttachmentSecurity not only allows you to unblock attachments in Microsoft Outlook, it also lets you block them as well. Thus, keep AttachmentSecurity installed so that once you've done what you need to do with a particular file type you've unblocked, you can add it back to the blocked list in order to maintain optimal security. Lookout Software, LLC. 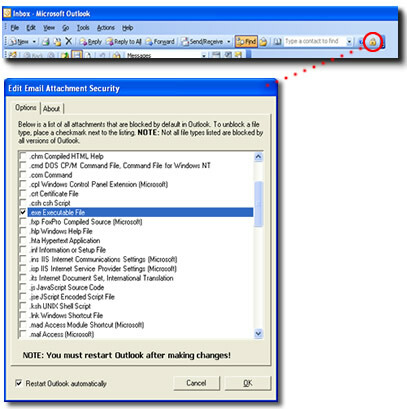 provides AttachmentSecurity for Microsoft Outlook to all users, free of charge. However, Lookout Software, LLC. is, in no way, responsible for damage that may be caused to your computer as a result of using AttachmentSecurity; nor is Lookout Software, LLC. responsible, in any way, for damage that you may cause to other's computers as a result of using AttachmentSecurity. Please read the AttachmentSecurity license agreement for further details.